​The title track from the CD, "Slackers In Paradise" featuring Ken Emerson on acoustic lap steel and Jim Kimo West on baritone slack key guitar. Video by Bill Montei of MEG Filmworks. Available on CD and vinyl as well as mp3 and on all major streaming sites. CONGRATULATIONS Jim "Kimo" West as part of "Weird Al" Yankovic Band on the album "Mandatory Fun" on RCA/Sony Records debuted #1 on Billboard, July 18th and just WON the 2015 GRAMMY in the Comedy Category. 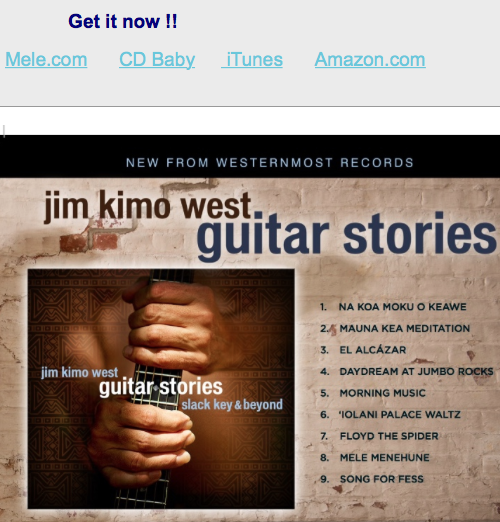 Jim "Kimo" played all the guitars and most of the keyboard and synths. They are embarking on a 100 city world tour in May, 2015. Having never even seen Waikiki, Jim “Kimo” West came right to Hana, Maui in 1985 and spent much of his time there for many years. It was in Hana where he first heard the music of Gabby Pahinui, Sons Of Hawaii, Sonny Chillingworth and Atta Isaacs. Already familiar with alternate tunings, the sound of ki ho’alu became his favorite “soundtrack”. the So Cal Slack Key Festival every year from 2008 through 2013. 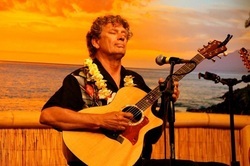 He has shared the stage with almost all the world’s top slack key players at one time or another. and in many documentaries. He recently composed all the music for the Hawaii production of “Ho’okele Wa’a-Turning The Canoe”, a film for the Sustainable Living Institute of Maui, directed by Danny Miller. Kimo says: "For a ceremony I would use My Hawaiian Heart and Na Halia Aloha for their emotional impact and Hanalei Morning for an uplifting, happy feeling. Also, My Hawaiian Heart and often use Hanalei Morning as a recessional." ***JUST ADDED*** Those "Haolewaiians", Ken and Kimo will be jamming out some smoking hot slack and steel duets here at this venerable Culver City music venue as a warmup for their set at the So Cal Slack Key Festival. Special guests,too ! Tickets and info here . For more info on Ken Emerson, just click here. There is no Hawaiian show like the So Cal Slack Key Festival-it has achieved legendary status in the world of slack key and has hosted almost all the living legends of ki hoʻalu at one time or another. This yearʻs lineup will include Cyril Pahinui, George Kuo, Makana, Jeff Peterson, Nathan Aweau, Danny Carvallo, Peter Moon Jr., Jeff Au Hoy, Ken Emerson and Kimo. Hula stars include Napua Grieg and 2013 Merrie Monarch "Miss Aloha Hula", Manalani English. The open-to-the-public Island Marketplace will feature island food and crafts as well as more music. See you there! Tickets and info here. 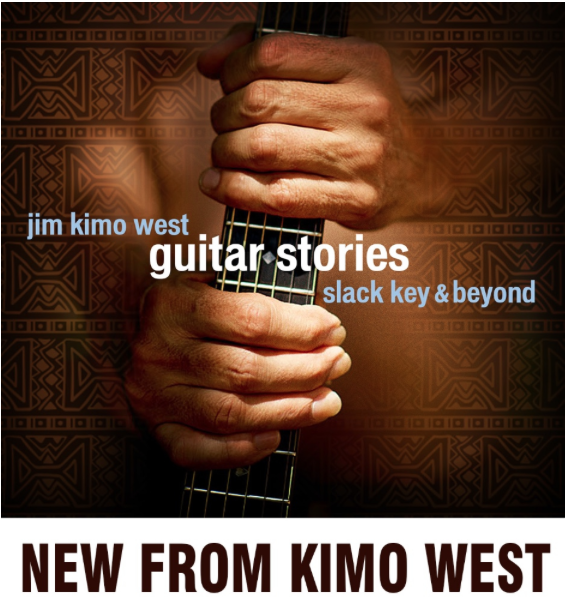 Kimo is honored to perform for the first time in Tim and Tina Johnsonʻs legendary guitar show. This series regularly hosts the wordʻs best fingerstyle guitarists, including Peppino DʻAgostino, Bepe Gambetta, Richard Smith, Lawrence Juber and many more! 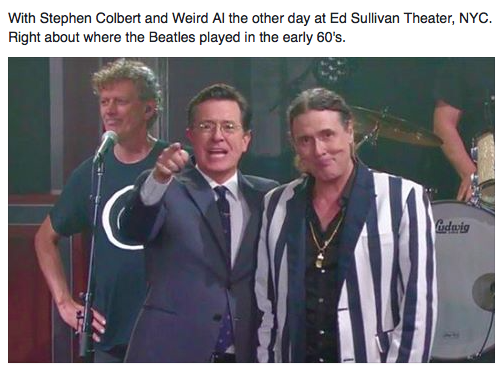 May 15 - Sept. 20 "The Mandatory Tour" with ʻWeird Al" Yankovic- tour datesannounced Jan 20!